"Cocca Anseatica" is derived from the following two words ... cocca - the name given in the 12. century to a vessel with the medieval characteristic of a ship with a round hull and ... anseatica coming from the german word " hansa" that meaning "associations" .This latter term was given to the North European cities of Amburgo and Lubecca that joined in an economical alliance to protect their earthly and especially maritime trades from the attacks of the English, Dutch and Flemish "barons" and corsairs. Other cities like Tallin, Kiel, Frankfurt and Brema later joined this association. From this group grew the development of the armed mercantile ship named "Cocca Anseatica". The Cocca Anseatica was 30 metres in length, had 20 metre length on the water line and a sail area of approximately 186 square metres. The net capacity was 130 ton. The crew consisted of 20 to 30 men. The sails were coloured with a vegetable dye order to avoid them from absorbing moisture. The colours of the sails were dark red, or with vertical white and red stripes or white and green or completely black. The Cocca represented in our model is the one from approximately 1470 with an overall length of 34 metres, 25 metres length on the water line, a draught of 2.5 metres and a sail area of 265 square metres. It was based on on the three masts - main, mizzen and fore. The net capacity had gone up to 400 ton. The crew was of 50 men and the sails were of a dark red with rope colour sewings. 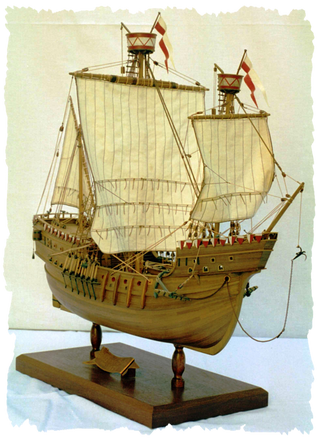 The following photos are an example of how a finished model of the Cocca Anseatica can look.